HostPapa offers impressive discounts and good value when you sign up, but beware the high renewal prices. HostPapa is a Canadian website hosting company which is still independently owned, as opposed to being a part of some massive corporation you've never heard of before. The company presents itself as a little different to the hosting giants, too, highlighting features like its support for sustainable business practices and green hosting. HostPapa's three shared hosting plans stand out for their low starting prices and high level of features, but beware – the introductory rates are heavily discounted, and the renewal prices are relatively expensive. The Starter account – from £2 ($2.50) a month initially, £9 ($11.25) on renewal – supports hosting two websites, offers 100GB of web space, unlimited bandwidth, 25 MySQL databases and 100 email accounts. One-click install of WordPress and other apps is available, there's a limited drag-and-drop Site Builder (three pages maximum, though), and you get one free domain registration. That'll be enough for many users, but 1&1's basic plan has fewer limits and is around half the price. HostPapa's Business account – £2 ($2.50) a month initially, £13 ($16.25) on renewal – is essentially the same package with ‘unlimited everything’: web space, bandwidth, databases, emails and domains. It's good value for the initial contract, but there could still be better long-term deals elsewhere. HostGator's Business Plan is £4.80 ($6) a month initially, but that includes a dedicated IP and SSL certificate, and it renews at £12 ($15) a month. The Business Pro plan – £9 ($11.25) a month initially, £22 ($27.50) on renewal – extends the package further with a wildcard SSL certificate, automated website backup, SiteLock malware detection, domain privacy protection, and no page limits on the Site Builder. Once again, you get a lot for the starting price, but after that it becomes expensive. This option is probably only worth considering if you really need the features and are happy to switch somewhere else once your contract is up. If you need more power HostPapa provides several VPS plans, but they're expensive, starting at £40 ($50) a month. The feature list is impressive, but not quite enough to justify the price. 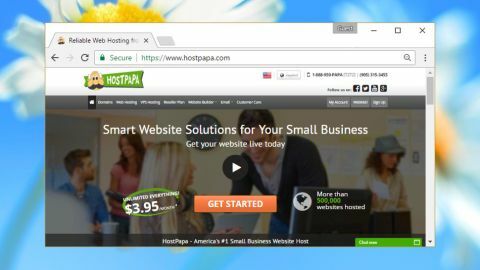 HostPapa offers a 30-day money-back guarantee for any hosting fees you pay upfront, with the usual exceptions of domain registrations and third-party add-ons. Check the small print if you're concerned. HostPapa offers three shared hosting plans, and although the website is a little short on their low-level details, it'll be easy enough to figure out which one is right for you. Signing up starts by entering your site domain. All the plans allow registering one domain for free, or you can opt to use one you own already. If you're going with the latter option, HostPapa defaults to a ‘please transfer my domain to HostPapa’ setting, but you can keep it where it is, if you prefer. The ‘order summary’ page took our apparent £1.95 a month headline rate and translated it into a final total of £129.72 ($162). How? Partly because it's a three-year plan, and partly because HostPapa adds SiteLock and backup extras to your cart by default – plus of course there's VAT on top. If you're looking to reduce the upfront cost, removing the add-ons cuts the total to £84.24 ($105). You can also reduce the period to anything from two years down to a single month, although the latter doesn't help much. Opting for a one-month deal costs you £8 ($10), there's a non-refundable setup fee of £10 ($12.50) for anything less than a one-year plan, and of course you'll pay the full renewal rate once your intro deal expires. Choose your plan and you're asked to enter the standard contact details: name, email and real-world address, phone number and more. Enter your payment details, too – credit card and PayPal are supported – and you're signed up and ready to go. The post-setup procedure isn't so smooth, mostly because there isn't one. The company doesn't give you a link to your control panel, or to a ‘getting started’ guide, or even tell you to wait for a welcome email. We were left with a summary of our hosting plan invoice, a print button, and that's about it. HostPapa's website may be short on welcome details, but the company makes up for it in emails. Within five minutes of payment we had one message with a plain-text invoice, a second with a PDF invoice attachment, another more general sign-up email with an order number, and an excellent ‘welcome’ email which came crammed with essential details. A link to a starter guide, quick advice on website building, dashboard and cPanel logins, account information, FTP account details and support links – all of these things are included. Other hosts occasionally offer more – name servers would be welcome – but it's still a useful resource. Logging on for the first time took us to HostPapa's customer portal. This loses points for the huge advertising banner right in the middle of the screen, which forces you to scroll down to see recent ticket and invoice information. All web hosts squeeze in ads wherever they can, but they're rarely as intrusive as this. On the plus side, the portal does give you straightforward links to cPanel, support, profile and other areas, as well as notifications and a network status indicator. Once you can ignore the advertising it's not so bad, or you can bypass the portal altogether by logging into other areas of the site directly. HostPapa uses cPanel as its host manager. This has everything experienced users will need, and novices shouldn't have much difficulty, either – key features like the File Manager and FTP module appear on the first screen, and a search box allows you to quickly locate anything else. One-click installs are handled by Softaculous, one of the best installation frameworks around. We set up WordPress in a few minutes with no hassles at all, and the service also supports popular web forums, wikis, image galleries, shopping carts and more. The drag-and-drop Site Builder isn't accessed from cPanel, rather inconveniently. It's hidden away behind a My Website button, presumably because it allows HostPapa to display an even larger ad on your upgrade options. Once discovered, the builder is reasonably capable, with 120 responsive templates and easy integration of videos, maps, forms and more. The free edition has a maximum of three pages, so your options are seriously limited, but it's still a likeable tool and we're happy it's included with the package. We're always interested to see what support a web host has to offer, and HostPapa has an unusual extra in a free 30-minute ‘one-on-one dedicated session with a PapaSquad Expert’. This is aimed very much at beginners who'd like some help with the basics, and you should expect some attempts to sell you other HostPapa add-ons along the way, but it could still help the hosting novice. Our own tests began with the HostPapa support pages, which didn't make a good first impression. There's no DreamHost-like search box to locate articles directly from cPanel, making sure you don't lose the context of your current task. Instead you must click a support link which replaces the current page with a support area, then click Knowledgebase to take you to the actual articles. This part of the site is presented very well. There's a clear search box at the top of the page, with links to common categories and subcategories underneath (Hosting > Getting Started, cPanel). Every subcategory displays the number of articles it contains, giving you an immediate idea of where to look first. Or you can simply enter a keyword and see what happens. The underlying database can't match the best of the competition. Searching for ‘import WordPress’ gave several relevant and helpful documents at DreamHost; here we had to search for ‘transfer WordPress’ to find just one. Searching for single keywords like PHP or MySQL returned a handful of relevant hits only, and even those were often very basic (‘About PHP’ included a paragraph of text and a link to Wikipedia). More fundamentally, searches don't even tell you how many matches they've found. The knowledgebase has a ‘Support (Live Chat/Phone/Email)’ link, but clicking it opened yet another tab – our third – and asked us to login to the dashboard again, even though we were logged in already in the first tab. You can ignore that link once you know it's not going to help, but it might make life easier if support was better integrated with the control panel. The search area has no button to launch live chat, and no mention of any support telephone number. You have to find these back on the main site. There's a support ticket system, though, which is presumably the company's preferred contact method, so we tried that first. We raised a basic product-related question. This wasn't sent immediately to our contact email, but was easy enough to track on the website. Response time was unremarkable at around four hours, but probably acceptable for a non-critical question, and the answer was excellent: clear, straightforward, even including an annotated screenshot to explain a point. Live chat was available on the main site, and there's 24/7 telephone support, often via toll-free numbers (check your country here). We weren't entirely convinced about the agents' low-level technical knowledge, but they did well with simple queries, and if we had something complex to address we'd normally do so via support tickets anyway. We completed the review by running a few simple server speed tests. Our page was hosted in the US so response times weren't the fastest we've seen, but running connection tests from other countries showed fractionally above-average performance. HostPapa is a fairly average host in most areas, but its starter discounts did catch our eye. The Business Pro plan could be a good deal if you need multi-domain hosting and SSL, and are happy to consider switching after three years.